Santa Fe is a city of romance! From the beautiful sunsets to the gorgeous architecture, this is the perfect city to spend with that special someone. Of course, one of the most romantic ways to spend time with your partner is a fabulous dining experience. Our area is known for its incredible cuisine, and experiencing the romantic restaurants in Santa Fe makes the perfect date night. Here are a few of our favorites! Do you want to know more romantic restaurants in Santa Fe? Access a copy of our free vacation guide today! 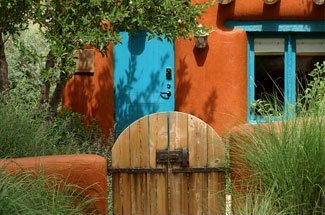 It has all the info on what to see, where to eat, and what you absolutely can’t miss during your getaway to Santa Fe. This guide has helped countless travelers plan unforgettable trips, so get your copy today! Sazón is one of the most beautiful and romantic restaurants in Santa Fe. Here, you will find a celebration of traditional Mexican heritage not only in its decor but in the quality of its food. Chef Olea’s moles are so famous and popular that they sell them separately on the website! Of course, there’s also the generous wine and spirits list; we know that no romantic evening out would be complete without a good bottle of wine. Plus, those that appreciate the arts will love Sazón since it is a showcase for some of Mexico’s very best artists. Art, atmosphere, and authentic cuisine come together to give you a date night you will never forget! Geronimo is home to a romantic atmosphere with an impressive pedigree. From the minute you step into this elegant locale with its authentic adobe walls and wooden beams, you’ll feel completely relaxed and ready to share special time with your loved one. Geronimo features an eclectic menu that changes seasonally so you can go back and try something new time and time again. We recommend making a reservation to try this prestigious eatery! If you’re looking to spice things up and get a little more creative, try the Coyote Cafe and Cantina. Overlooking the busy streets of Santa Fe, this restaurant gives you a unique perspective of the city. The food is delicious, the style impeccable, and the atmosphere unlike anything else. Why not spend a lunch or dinner here? An evening out at any of these romantic restaurants in Santa Fe is a perfect night. 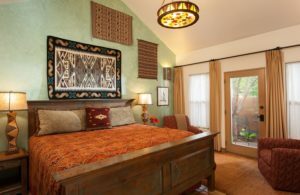 Make it even more special when you book a romantic getaway at Four Kachinas! Browse through our cozy accommodations to start planning your stay. All of our rooms come with their own private or shared patios, perfect to relax with your sweetheart outdoors before retreating to your room for the night. 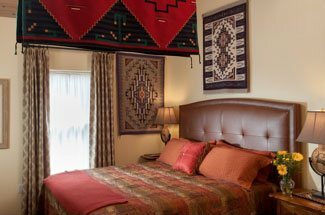 With a king bed, private patio, and its own private entrance, our Zia Room is perfect for romance. Share a bottle of wine under the stars, then wake up in the morning to a delicious breakfast. We look forward to hosting you at Four Kachinas! Why You Need to Hike the Old Spanish National Historic Trail — Explore These James Beard in Santa Fe Award-Worthy Restaurants!